Note: 6 staterooms, 30 berths, ladies' cabin 16 - berths, dining room richly paneled & gilded. Lake Michigan Steamboat Co, James Abbot, president. Two 40 x 87", 80hp vertical beam engines, Silas Battell, Buffalo, NY by Detroit Iron Works. 28' wheels. The 2 independent engines made handling difficult. Length overall 156'; beam over the guards 53'. Largest steamer on the Lakes; "Queen of the Lakes". 1833, Apr 27 Launched; ran Buffalo, NY & Green Bay, WI. 1833, Sep 30 Enrolled Detroit, MI. 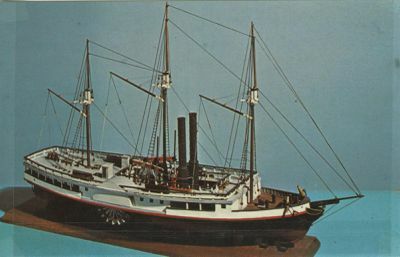 1834 13 day, 2,000 mile excursion tour to Mackinack, MI, Green Bay, WI & other Lake Michigan ports. 1835, Sep Stranded & released, Detroit River. 1835, Oct 19 Collision with schooner INDEPENDENCE, Black River. 1840, Jun 12 Carried 1,270 passengers in 1 trip to convention at Perrysburg. 1840, Oct 3 Stranded near Buffalo, NY. 1842 In ordinary all summer. Before 1847 in a list of steamboats "broken up"
1853 - 54 engines to R.R. ELLIOTT.